ST. MICHAEL, Minn. – Jet Edge, Inc., a leading manufacturer of ultra-high pressure waterjet technology, is bringing its latest precision waterjets to FABTECH, Nov. 9-12 at McCormick Place in Chicago. Look for Jet Edge in Booth S1974. During FABTECH, Jet Edge will perform live 5-axis abrasive waterjet cutting demonstrations on its X-Stream-powered EDGE X-5® 5-axis waterjet with Aquavision Di control and Closed Loop Filtration System. The waterjet manufacturer also will show its new low-cost BOSS-CUTTER™ 3-axis waterjet system, its new 55,000 psi (3800 bar), 30HP iP60-30 waterjet intensifier pump, and its premiere X-Stream pressure intensifier pumps. 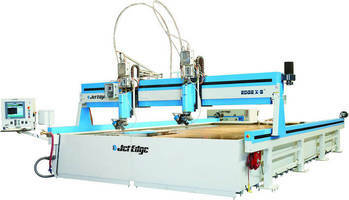 Jet Edge’s EDGE X-5® 5-axis waterjet cuts precise taper-free parts from virtually any material. The system is capable of cutting sophisticated 3D parts such as impellers and bevels up to 50°. This workhorse waterjet system is designed to provide years of dependable service in harsh industrial environments. Its sturdy design separates the motion system from the catcher tank, eliminating vibration and ensuring maximum part quality. The ball screw-driven system features direct-couple AC brushless digital servo motors, providing the best repeatability in the industry at +/- .001”. Critical bearing components are protected with heavy metal covers with brush seals and positive air pressure. Productivity enhancing options include a second cutting head with mirror cutting capabilities, a pneumatic drill for pre-piercing materials that are prone to delamination, automatic submerged or above-water cutting capabilities, and a proprietary laser plate mapping feature that allows precise nozzle-to-plate standoff. The EDGE X-5 features Jet Edge’s Aquavision® Di industrial PC, which gives operators the freedom to fine-tune programs from any CAD/CAM/nesting software, utilizing advanced HMI features and/or standard GM code. The EDGE X-5 waterjet machine is available in many sizes, from 5’x5’ (1500 mm x1500 mm) to 24’x13.’ (7300 mm x 3900 mm). Jet Edge’s BOSS-CUTTER 3-axis waterjet system cuts parts up to 6” thick from virtually any material. The BOSS-CUTTER has a work envelope of 59" x 59" (1500 mm x 1500 mm) and can accommodate sheet sizes up to 67" x 67" with a minimum of 5/16" of clearance all the way around. The system comes standard with a 30hp Jet Edge ECO-JET direct-drive pump, but can be upgraded to any of Jet Edge’s 55,000 psi (3800 bar) waterjet pumps. Jet Edge offers both direct-drive pumps or hydraulic intensifier pumps, available in 30-280hp models. The BOSS-CUTTER is controlled with a Windows® PC and includes FlashCut Pro-Series Stepper Controller, FlashCutCNC software and IGEMS path generation software. Jet Edge’s 100hp (75 kw) X-Stream® xP90-100 waterjet intensifier pump supports 75KSI (5200 bar) continuous operating pressure. The X-Stream achieves much faster cutting speeds and drastically lowers operating costs compared to traditional 60KSI (4100 bar) water jet pumps, enabling users to increase productivity and reduce part costs. The X-Stream produces 50% more pressure than a 60KSI (4100 bar) intensifier pump, resulting in a 40-50% increase in productivity for many materials. Compared to a 60KSI (4100 bar) pump, typical operating pressures of 75KSI (5200 bar) use 30% less water, 30% less power, and up to 50% less abrasive, resulting in a 40% reduction in operating costs. The xP90-100 is capable of producing flow rates of 1.45gpm (5.49 L/m) and supports up to a .017” (.43 mm) orifice. Fittings and tubing are rated for 100KSI (6900 bar). The X-Stream is backed by nearly 10 years of extensive research and development in hyper-pressure technology. The X-Stream also is available in a 50hp (37kw) model. Jet Edge’s new iP60-30 60,000 psi (4100 bar), 30hp (22 kw) hydraulic waterjet intensifier pump is designed for waterjet shops that desire the reliability of a hydraulic intensifier pump, but have limited power. The iP60-30 draws only 37 full load amps at 460vac (60Hz) or 74 full load amps at 230vac (60Hz). It is capable of producing 0.6 gpm (2.3 L/m) of ultra-high pressure water at a continuous operating pressure of 55,000 psi (3800 bar). Economically priced and easy to maintain, the iP60-30 is ideally suited for rural shops, RD labs, schools, and small budget-conscious waterjet cutting shops. Jet Edge offers the widest range of waterjet pumps in the industry. Its pumps include hydraulic intensifier pumps and direct drive pumps. 36KSI (2500 bar), 60KSI (4100 bar) and 90KSI (6200 bar) models are available from 30-280hp (22-208kw). Electric and diesel models are available. Jet Edge's Waterjet Closed Loop Filtration System eliminates the need for a drain by filtering and reusing water. A closed-loop filtration system prevents the introduction of hazardous materials into drainage systems, protects the waterjet pump, maximizes orifice life and reduces water/sewage costs. Established in 1984, Jet Edge is a global designer and manufacturer of waterjet systems for precision cutting, surface preparation and coating removal. Jet Edge systems are used around the world in a broad range of industries, from the world's leading airlines to automotive, aerospace, industrial manufacturers, machine and job shops. Jet Edge waterjets are proudly made in U.S.A.
For more information about Jet Edge, visit www.jetedge.com, e-mail sales@jetedge.com or call 1-800-JET-EDGE or +1 763-497-8700.